From JeffBulas.com by Maxwell Hertan of Megaphone Marketing. 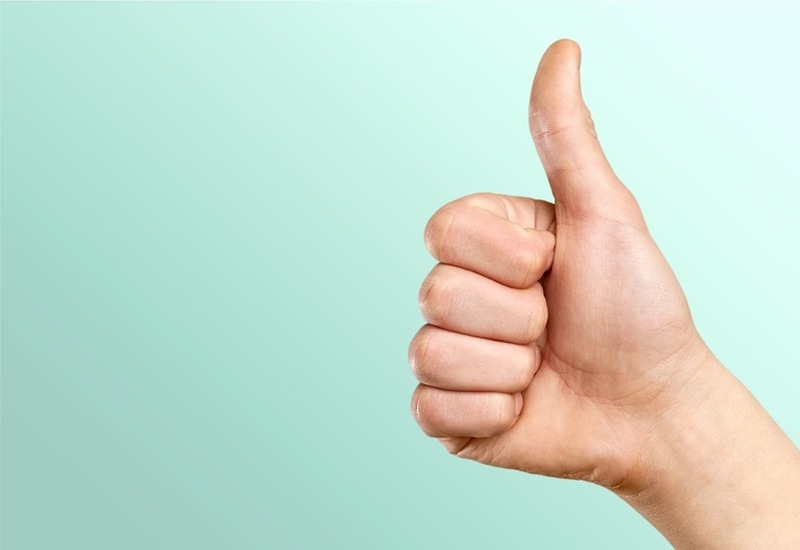 Have you marketed on Facebook but haven’t seen any significant improvement in your sales? Sometimes it may seem easier to focus your energy elsewhere in your business rather than pursue a medium that is constantly evolving and changing. However there is a simple 4-step process which is achieving amazing results for businesses world-wide and it can help to bring your Facebook strategy back into focus. It follows the funnel strategy that you have probably heard about before but may not know how to effectively implement on Facebook. Here, the strategy is simple. You are merely trying to get on our prospects radar. It doesn’t matter what you are selling, the important action in this step is to provide value to the prospect. This is done by providing content that relates to them and strengthens their belief that we share a common interest and values. It’s too early to be pitching a sale to this prospect as they haven’t had a chance to develop confidence in the brand or service. 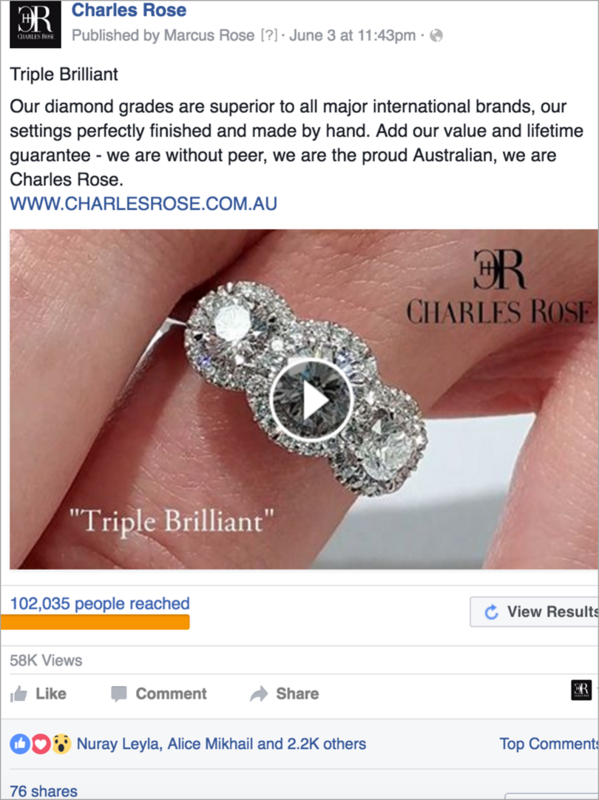 A simple video of a ring can create a perfect initial engagement with a prospect and begin to offer them value. A quality video, boosted to the right audience is a great first way of connecting with potential prospects. Another way is simply a “Like” ad. With this new group you can begin filtering through to find the ones that actually are interested in your offering. They make themselves known by liking your page, which is invaluable as we move through to step 2. In the middle of the funnel we have now isolated an audience group that have indicated some interest in our offering and are primed for further engagement. It’s important to think of the amount of trust and engagement that is needed to make a purchase, and to vary the engagement strategies accordingly. For example someone looking to choose an accountant may need months of nurturing with good content. This is because people don’t select an accountant very often and a lot of trust may be needed for a prospect to come to a decision. Conversely a product like a $100 watch may be bought on impulse. You may just need to show a few images of some influencers wearing the watch and some text on the watch features to prepare them to make a purchase. Often, the less common a decision is made, the more expensive the purchase and the more research a customer will need to do before deciding they are ready to purchase. Which means the longer duration in the step 2 phase. Ok, we have built an audience, we have engaged the audience, now what? Well, remember that we don’t own the audience. 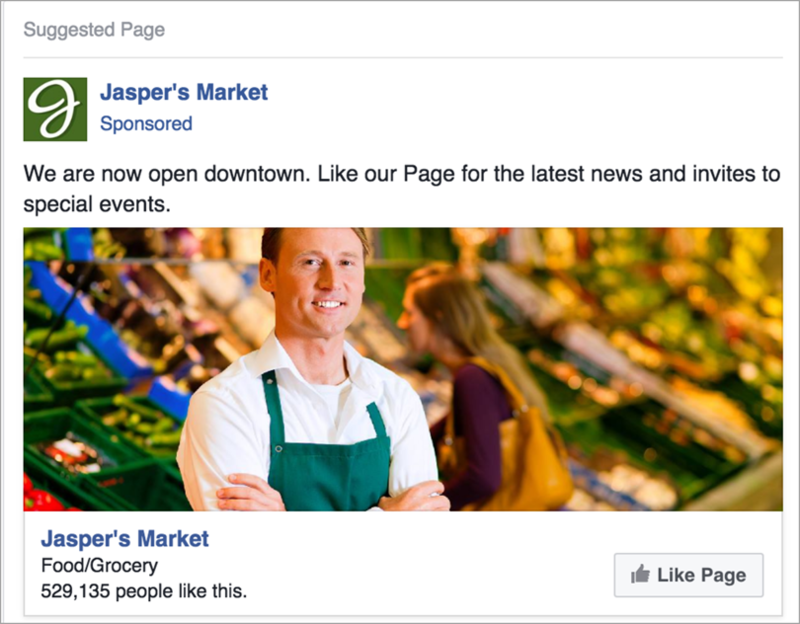 Facebook can change their algorithm at any time (although they are aligned with the best interests of the advertisers). Now is the perfect time to start building your email list. It’s also great to have touch points with your audience on multiple platforms and email performs as well. Facebook is an amazing platform to build your email list. It’s very scalable & extremely effective. The Viral Promotion – This is a strategy that involves a significant giveaway that ensures those that enter are potential customers. If you are a bike store, you can give away a helmet or bike gear. It can get a little trickier if you are in a services business like an accountant so you may have to get creative, perhaps giving away a business book pack or seminar tickets. The “viral” secret – It’s always better to have a way to encourage those that enter to share, which is why you build a viral thank you page where the entrants can invite friends to win either more entries or more prizes. We find that this viral element on average increases the number of entries by 40%! The Opt-in Offer – This is simply a free “giveaway” in exchange for an email and it can come in many forms. Webinars, e-books, free samples, audio clips, video series, content extensions, seminars & more. Find something that is providing value to the audience and also suggests that they could be a potential buyer of your product. For example a scarf company may giveaway a book on 25 different ways to wear your scarf this summer and an accountant may giveaway 5 tips to minimize your tax leading up to the end of the financial year. You’ve selected an audience, isolated them, engaged them and even added them to your email list. Now it’s time to convert this investment into revenue. Emails – Once a user signs up for a promotion it’s great to email them after the promotion to let them know the results. Then you can follow up with some emails introducing them to your company, what you stand for, why you started, what problem you solve & then ask for the sale. Emails are perfect for increasing customer lifetime and creating a foundation to build upon. Retargeting – These are those ads that follow you around after you have visited a website. All the biggest ecommerce websites use this because it works. 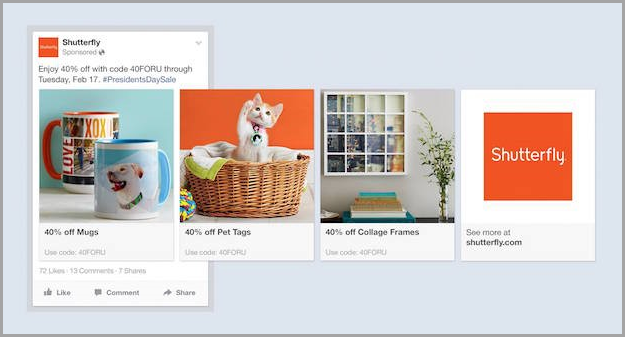 You can set it up on Facebook to follow around your website visitors that haven’t purchased for 14 days with product shots to get people back and ready to buy. Direct – This is a perfect chance to showcase your products to start cheaply bringing people to your website. A carousel ad can show up to 10 images for the cost of 1 impression and can be great to showcase many different benefits or a range of different products. 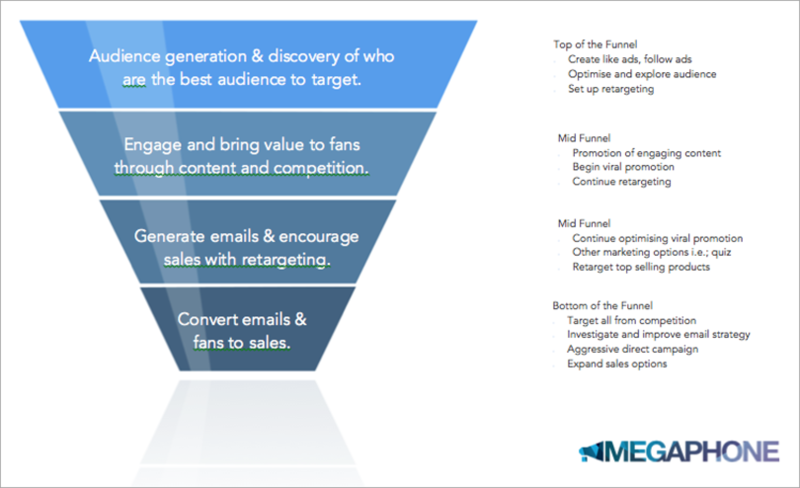 By undertaking the 4 step funnel strategy you have developed a clear and concise path to Facebook marketing success that will continue to build meaningful relationships with your customers and create significant financial gains for your digital marketing strategy. Guest Author: Helping businesses grow is what drives Maxwell Hertan. As the Founder and Director ofMegaphone Marketing, his focus is on delivering data driven results, ensuring every client has the highest return possible.